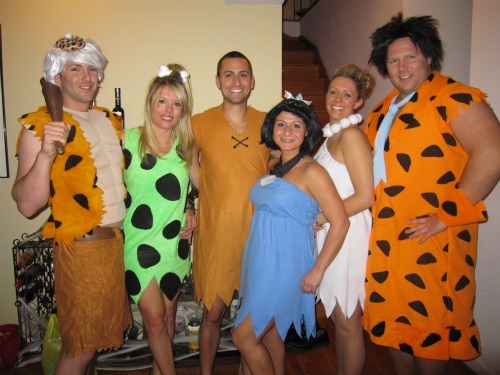 Meet the Flintstones! I spent Halloween weekend in NYC with friends visiting from Boston and DC. Don't you love the group theme? First treat on my menu - Halloween themed Funfetti cupcakes. I scoured Jo-Ann's, Wal-Mart and Target for the decor. Didn't Teddy make a great Bam Bam?! I wasn't a fan of the Pebbles costume in stores so I commissioned my mom to sew a simple dress out of green fleece and we attached the felt spots with spray adhesive. Wilma and Barney (Kate and Mike) have been together for years and Betty (Rosalin) is engaged to Fred (Andrew). Some people were very confused when we all went out to the bar... costumes just worked out that way. 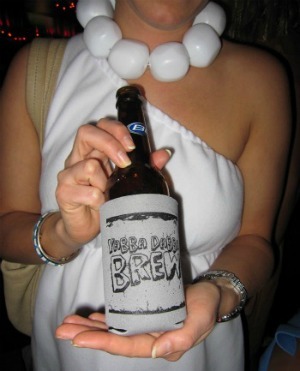 Wilmaaaaaaa surprised us with "Yabba Dabba Brew" coozies. The only thing we were missing was Dino. 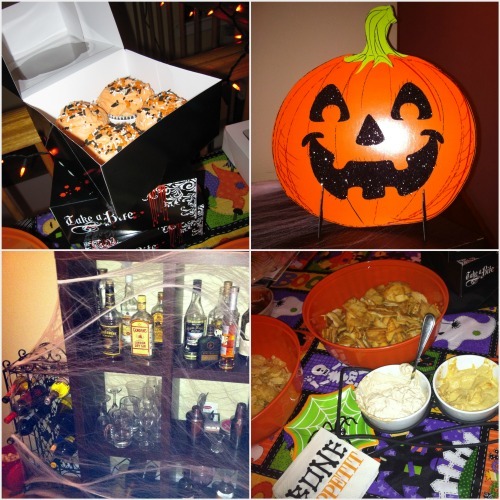 LOVE the group theme, and great idea for the dress:-) Looks like a fun Halloween weekend! aw that is so cute! I want to do a group theme sometime in the future. 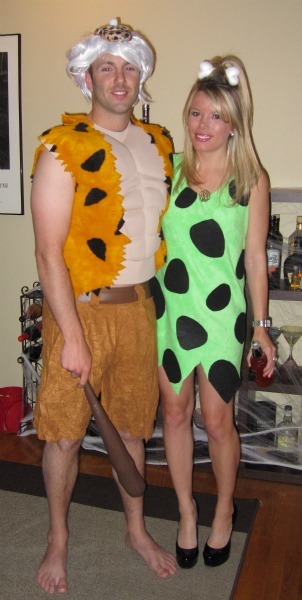 I was pebbles a couple years ago for halloween but I had to do a couple in home alterations before I was happy with the costume. You looked very cute though and I love those decorations! Oh my goodness, what cute costumes! You make a perfect Pebbles. :) Happy Holloween! Those coozies are so cute! Awesome theme! GREAT costume ... I especially love the bone in your hair! looks like a blast! love your costume! so clever!! I love the costumes and your decor was phenomenal! Wow!! What an absolute blast..how fun :) Great shots! GREAT outfits! You guys look so adorable! :) Love it! Haha I love yalls costumes! Your homemade costume is way better than any pebbles in store! 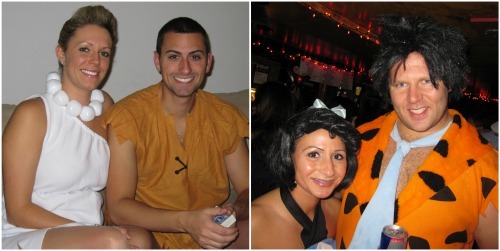 Were you reminiscing of your days at Digitas with the Pebbles costume?! love! that is too cute!! and i bet y'all stood out instead of looking like everyone else. Love the costumes! Yours was adorable, love the black pumps!! Hope you had a good Halloween!! ha, I love your plastic bone hairpiece! Did you make that too? You are soo cute!! Such a great idea for costumes! I LOOOOOOVED your costume!! You looked HOT!!!! Love the group theme idea! You looks fabulous! Ali and Dan tied the knot! Leopard, bows, plaid ... at Kohl's?